News Alert: Want to join in on the fun? The #BloggersWhoBudget Collab will now be open for you to link up with us starting next month. Join us in November for "Mad for Plaid" featuring your favorite plaid piece under $75 & in December for "Holiday for Less"! 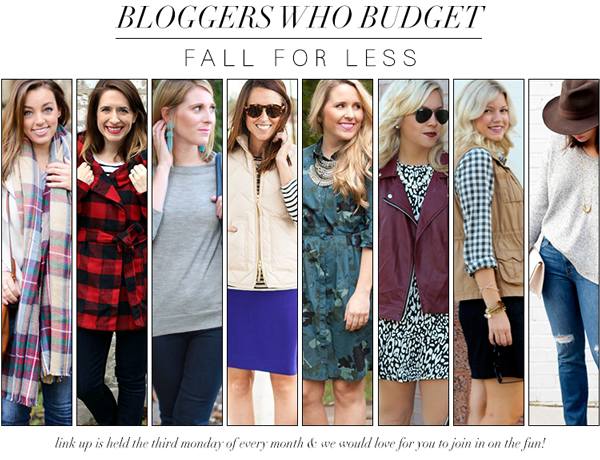 If you have your own budget style, we want to see your look too! Swing by every third Monday of the month starting in November and follow the instructions to link-up with us! As you have probably noticed, more & more of my wardrobe hails from J.Crew Factory. They really have established themselves as a place to find quality pieces, of both the seasonally trendy & closet staple variety, for less! In the past J.Crew Factory offerings were hit or miss, with varying levels of quality as well. But in the last year, the store has upped their selection, always bringing consistent construction, & prices that fall easily into my budget. My J.Crew Factory shopping game? I have found their sizing to be different than regular J.Crew store sizing, so I like to place a large order online (always spending enough to get free shipping!). I can then try on all the items in the comfort of my own home, easily experimenting to find what will play well with other items in my closet, & weeding out the cute, but not so functional pieces from the rest. We have a local J.Crew Factory store, so I make any returns in store to avoid having to pay any return shipping costs. The three pieces making it into my teacher capsule wardrobe? 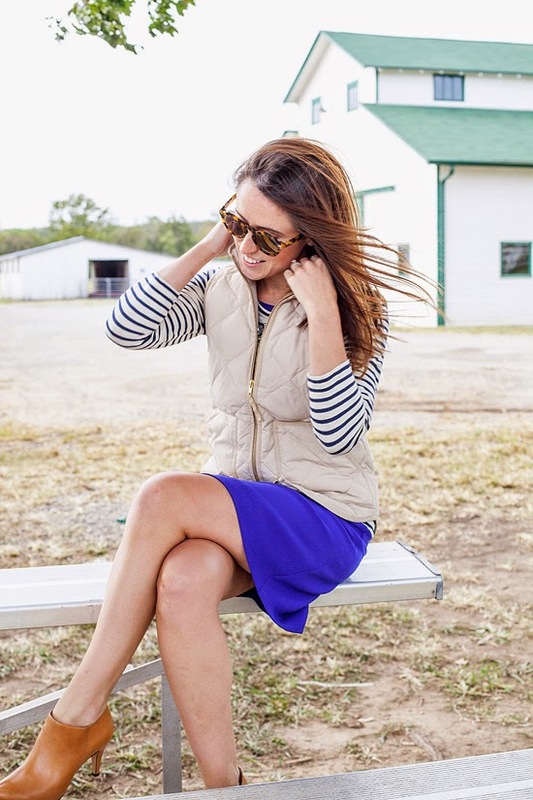 This puffer vest, bejeweled striped top, and crepe dress (with pockets!). I actually purchased this dress from the regular J.Crew store, as it was on SUPER sale at the end of the Summer, & I am super excited to have found it in the Factory store as well. I am definitely thinking about scooping it up in black, as I love it so much! I can see that quilted vest coming in handy many times these days. Great effortless look! Simple and stylish casual outfit! Love it! I've been trying to think of ways to make a puffer vest a little less casual and you are totally helping a sister out. Such great blogs! I love you look here! 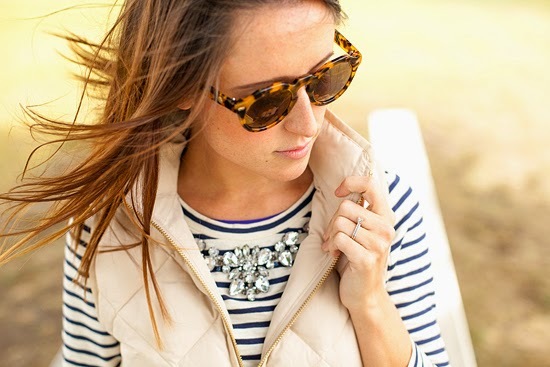 The stripes are great- such a perfect look for fall! Love the Bloggers Who Budget idea. Always fun to see new series ideas, looks like I may be linking up next month. I can't pass up some plaid. love your necklace. I like that fact you ladies opened this up to everyone next month. 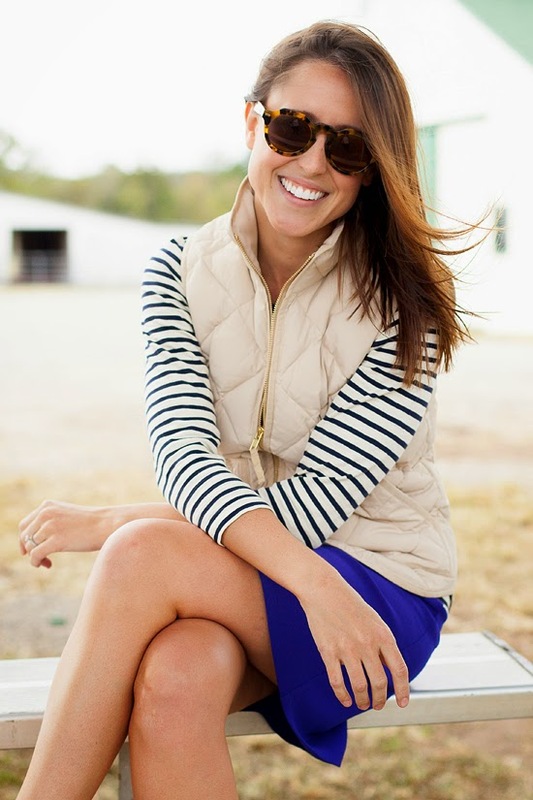 I saw that vest at JCrew Factory and wanted it too but opted for the black quilted jacket instead. I love that store too! They definitely have great staple pieces. I love the shirt layered over the dress! I don't own much from J. Crew Factory so I'm always nervous about ordering online. I love the vest! perfect for fall and I bet chilly classrooms. Those are the perfect booties for fall! Love them! Just ordered a puffer vest myself! Love this look! I agree! J.Crew Factory is my top shopping spot currently. And aren't those booties SO comfy? I have them in black and I love them!